For special occasions. That is why venison is bought in the holiday season, either for private consumption or by restaurants. At the restaurant people like to eat what is not readily available at home. For the specific characteristics of venison in the light of it being health food. Venison contains very little structural fat (young deer merely 0.5%). Moreover, producers cannot possibly tamper with their animals in any way as deer cannot be bred intensively nor manipulated by humans. Moreover, deer are not subject to any of the diseases that put a heavy strain on regular livestock farming. The usage of medicine is close to nil and so is medicine residue. Naturally, there is no point in consuming venison once a year with a view to improving one’s health: with the health point of view venison should replace more greasy meats on a regular basis. Any venison is good for your health, even when imported or hunted. Most venison is imported from New Zealand. Their production systems are the same as ours in Europe and more specifically to ours at the Marquettepolder farm, the main difference being its freshness: there is no need for our meat to cover such distance before landing on your dinner plate. Venison from New Zealand, except when frozen, has most probably been vacuum packaged for months before reaching your Christmas kitchen: the kiwis just physically can not prepare all the abroad needs for venison in a few weeks. Having been vacpacked for so long the venison has undergone autolytic changes that have rendered it gooey and soury / acidulous. One really does not need to be a connoisseur to taste the difference and find our fresh product superior in taste and consistency. Moreover, as there is no need for transportation from the other end of the world with locally produced venison, ours leaves a smaller ecological foot print by far. Beside imported farm-bred venison there is also venison from hunted wild animals. With the latter the consumer has no way of knowing the age of the deer shot nor the circumstances in which it was hunted: the stress of a hunt (battue) is detrimental to the tenderness of the meat, which you will distinctly assess on your plate. A young deer which has not been killed in nature and shot from up-high renders an outstanding roast. With wild deer, the consumer has no way of finding out the way in which the wild deer was hunted, nor its age. This is why venison from wild deer can turn out rather disappointing: it may be found rather to very tough. The latter is never the case with farmed venison from young deer. Venison from hunted deer has often been left to ripen for too long in order to tenderise it. 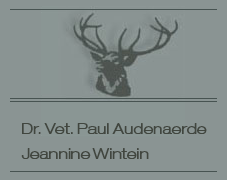 This explains its strong venison taste, which is no-existent with farmed deer. A simple phone call (0032 477 428114) will suffice in order to find out our distribution channels. There is a link at the end of our website to our colleague who buys most of our livestock for slaughter, i.e. our young deer that are unsuitable for breeding or trophies: Marc Peelman, Kruisveldhoeve, Sint-Amands.